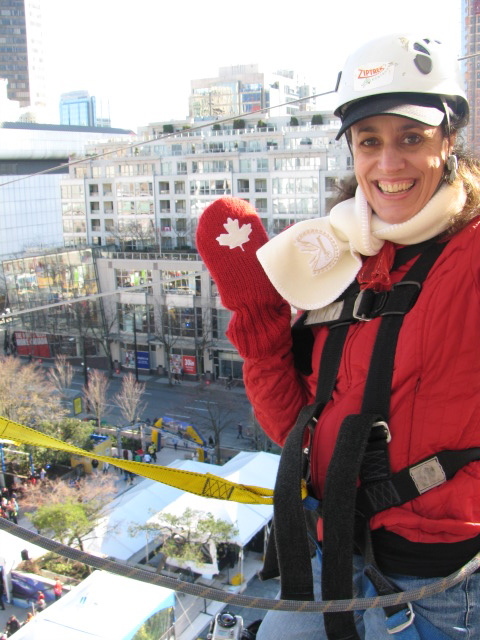 When I first learned that the Olympics were coming to town, I was amongst those against the idea. I jumped on the “let’s get out of Dodge” attitude. As the Olympics drew closer the politics, the potential problems, and the ethical questioning also heightened. Then a strange thing occurred. Innocently, I “retweeted” a tweet about an Olympic Hockey contest by Tourism B.C. and a couple of days later it was announced that I had won. I won? What did I win???? I was baffled as I didn’t even know I had entered!! I had mixed feelings as I thought someone more fanatical than me should have won the 3 hockey tickets, the limo, the hotel, the Hockey House day, and then…. I started to get excited, really excited!! As I write this, I’m sitting in my hotel waiting for my “limo” to pick me up to go to two Women’s hockey games while my guy is watches the Men’s Hockey game! 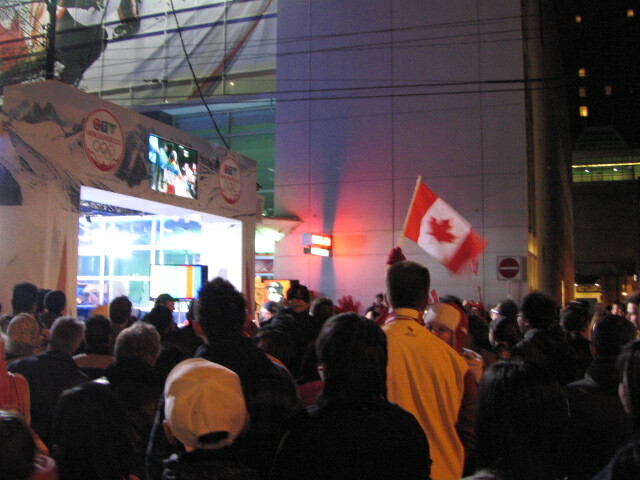 And, last night I was standing at a perfect place on Robson St. with an energetic crowd as Canada’s Jon Montgomery won gold on the Mens Skeleton. Just before taking the leap! Needless to say, I admit that I have set aside my earlier apprehensions for some Olympic playtime. It really is fantastic to see everyone having so much fun, sharing energy, and a sense of Canadiana of which I’ve never witnessed. I’m sure the Olympic hangover will be tough, and things are far from perfect. But, for now… I’m just going to continue to join in, play, and recharge my sense of fun. Hope some of you are doing the same, or at least that the spirit has affected you wherever you are! Witnessing Jon Montgomery's Gold Medal Skeleton! Trilby, you lucky bum! I am sooo very jealous. It looks like you’re having a fabulous time out there and I am thoroughly enjoying all your tweeting, so keep us posted!